One night during the local duck hunting season a police officer was staking out a particularly rowdy country bar for possible DUI violations. At closing time, he saw a duck hunter tumble out of the bar, trip on the curb, then try his keys in five different cars before he found his. He sat in the front seat fumbling around with his keys for several minutes. All the other duck hunters left the bar and drove off. Finally he started his engine and began to pull away. The police officer was waiting for him. He stopped the driver, read him his rights and administered the Breathalyzer test. The results showed a reading of 0.00. The puzzle officer demanded to know how that could be. 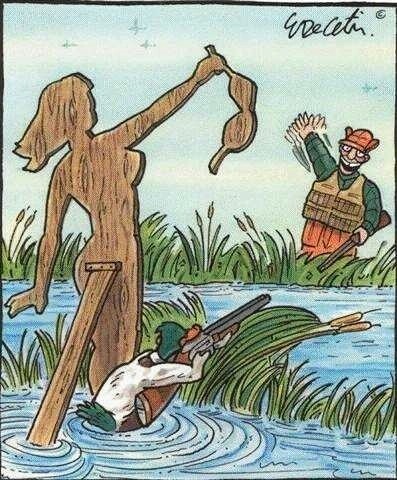 The duck hunter replied, "Tonight I'm the designated decoy."